TONIGHT! Limited tickets will be available for purchase at the door. There will be heated areas on site where you can warm up and/or keep dry. Cash bar on site and Basket Case catering – yum! This is a ticketed event: Tickets are $25.00 for adults and $20.00 for students and seniors. Purchase your tickets online at Ticketseller. There will be a limited number of tickets available at the door. Doors open at 6:30 pm, and the show begins at 7:30 pm RAIN OR SHINE and a selection of refreshments will be available for purchase. Basket Case Picnics will be catering the event. 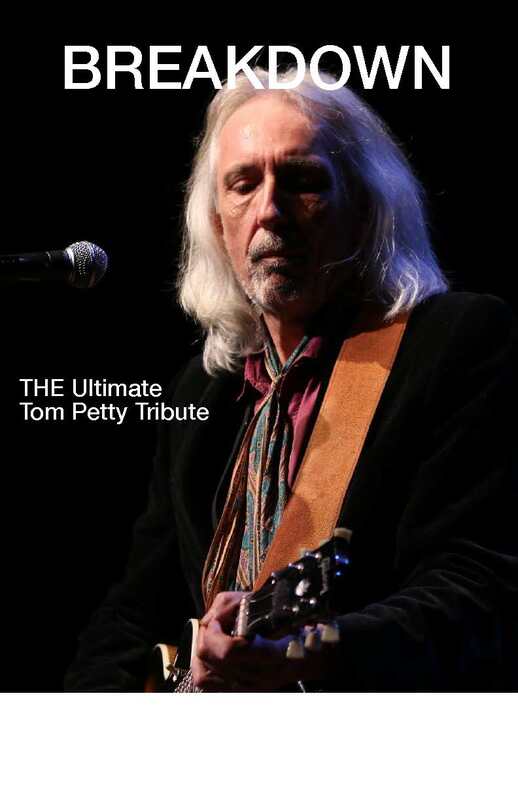 BREAKDOWN’s tribute show is being described as “the most accurate representation of Tom Petty and the Heartbreakers.” Covering all the hits from as early as 1976, BREAKDOWN re-creates the look and sound of a live Tom Petty performance. In a theater, club or on a festival stage, it’s always an exciting, energetic show. BREAKDOWN is the coming together of professional musicians who share a genuine love and appreciation of this legendary band. Marty’s ability to “magically morph” into Tom Petty provides the opportunity to make this convincing show a reality. You will be thoroughly entertained by this “southern gentleman” and a band that totally rocks! Memberships will be available for purchase at the event. Proceeds go directly to the artists and toward programs and events at the Centre. Parking is not available at the Caetani Centre during events and patrons are asked to park off site in approved parking zones, and to please respect our neighbours by not blocking driveways. Check out BREAKDOWN’s website here. Next Post:Youth Theatre Summer Camp with Amelia Sirianni registration now open!